Women with polycystic ovarian syndrome (PCOS) often have issues with insulin resistance leading to high blood sugar and would benefit from following a low glycemic index diet. 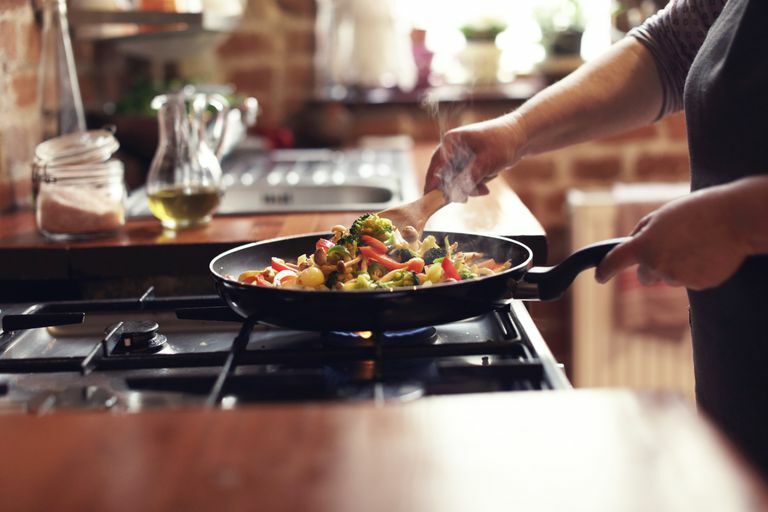 But after a long day of working and/or taking care of your family, it can be hard to think about preparing dinner, let alone learning to cook new recipes. The good news is, switching to a low glycemic index (GI) diet doesn’t have to be difficult and it certainly doesn’t mean that you have to slave over a hot stove for hours at a time. Check out these suggestions for low glycemic dinners. There’s no rule that you have to eat traditional breakfast or lunch foods for those meals; breakfast can be great for dinner. Omelets, French toast using 100% whole wheat or low carbohydrate bread, or a sweet potato hash with vegetables and sausage are all very simple to make and can be easily adapted to the low glycemic index diet. You also can’t get much easier than a bowl of soup with a salad. Make a big pot of your favorite soup and freeze individual portions. So easy to thaw and reheat on a particularly busy night. Aim for soups that are heavy on low carbohydrate vegetables and low in starch. Clear broth-based soups with lots of low carb vegetables, like chicken and vegetables or beef and mushroom, or vegetable purees, like cauliflower and leek soup, are easy low GI options. Stay away from high GI starchy soups, like split pea, corn chowder, or potato soup, which can cause blood sugar spikes. Switch out your regular pasta for a whole wheat, low carbohydrate or vegetable (like spinach or tomato) version and make your favorite recipe—spaghetti and meatballs, baked ziti, or even lasagna. Those are great because they also freeze well; make a big batch of lasagna and stick extra portions in the freezer for busy nights. You can also swap out veggies for pasta, such as julienne zucchini or spaghetti squash, or even serve your sauce over sauteed spinach. One of my favorite meals is a veggie stir-fry or fried rice. Saute whatever vegetables you like (keep a bag of stir-fry vegetables in the freezer just for busy nights) in a little bit of olive or canola oil until done. You can either toss in a little soy sauce and serve over brown rice or throw the brown rice right in the pan with the vegetables. Scramble an egg or two and add to the rice and vegetable mixture and toss with soy sauce. Of course, you can add meat to your stir-fry; chicken, pork and even shrimp are all great ways to add protein. Just make sure that your meat is fully cooked through before adding your vegetables. Another great option is to pick up a rotisserie chicken from your grocery store and serve with a salad or a side of steamed or roasted vegetables. Keep the leftovers and use the chicken for other meals later in the week. You can make chicken salad (try light mayo, chopped apples, celery, and pecans), chicken fajitas, chicken quesadillas (you can find low carb wraps in your local grocery store) or even make a simple grilled chicken sandwich (don’t forget 100% whole wheat bread). Chili is really simple and healthy as well, and can even be made in your slow cooker. Just throw in your ingredients in the morning, set it to low and let it cook all day. Use 2 cans of whatever beans you have in my pantry (kidney beans, cannellini beans, and pink beans all work well), a can of diced or stewed tomatoes and a large can of crushed tomatoes. You can also sauté some chopped veggies (garlic, onions, carrots, celery and/or green peppers) and ground meat (beef or turkey work well) and add those to the pot as well. Season with chili powder to taste. Serve over brown rice. The key to making changes to your diet is planning ahead. Sit down each week and figure out what you want to cook for dinner and make sure to buy everything you’ll need beforehand. There are a ton of websites that offer other ideas for low glycemic index dinners. PCOS and Diet: Is Low Carb Right For You?